As with most creatures of myth, dragons are understood and depicted in different ways by different cultures. In the East, dragons have long been seen as benevolent guardians, and even now those born in the year of the dragon are said to take on their characteristics of wisdom, long life, wealth and luck. Images of dragons, in and around the home, are supposed to bring good fortune. 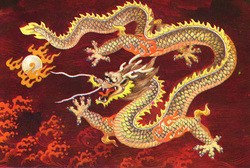 Most notably from China and Japan, Eastern dragons are very powerful but usually benevolent. They are revered for their great wisdom and are often worshipped as mythical rulers of nature and the weather, particularly of water and rain. Unlike Western dragons, these dragons usually do not have wings because it is believed that they fly by magic. This type of dragon is associated with Imperial China. It is a serpentine dragon with a large bearded and horned head. It also has 5 claws, while all the other oriental dragons have less. These mighty beasts carried the houses of the Gods on their backs, and thus shielded them from all evil influence. These vast Air Dragons are blue, and their many hues and shades makes them difficult to see. They control the weather, clouds and winds, and bring life giving rain to the land. However, they can be temperamental, when not respected, and tend to summon storm and drought when angered. These dragons are depicted holding a pearl in their claw or mouth. The jewel symbolises both wealth and wisdom. They are said to multiply anything they touch. They live underground, guarding gems and precious metals. Earth dragons control the physical course of the rivers, and tend the banks but, in the depths below great Water dragons govern this domain. Each river in China has its own "Dragon King". In the mythologies of the West, most dragons are dangerous. Some live in caves where they fiercely guard hords of gold and treasure. Others terrorize towns and villages, demanding human sacrifices to eat. Unlike Eastern dragons, there are numerous legends of these terrible beasts being hunted down and killed. This form is the more widespread and classically shaped dragon. It is often a huge beast, with formidable teeth and claws - although smaller forms are sometimes found. They walk on all four feet, and have an "arrow head" shaped barb on the end of their tail. There is a ridge, or crest of spines along its back, but their wings are normally relatively small. This dragon has two legs and powerful wings, with a long serpentine tail. Sadly, the legends of this benevolent, life giving, creature have all but been lost, and it is now portrayed as a savage, warlike and envious beast, that often brings sickness and pestilence. There are many forms of water dragons. Some are totally aquatic, whilst others are amphibious. Most dragons like to be near water, and they can take on many forms, from the serpent to the more "classical" shape. Swamps also provide homes for various small, squat types, and ridged backed and bearded serpents. "Knucker" holes in England are reputed to be bottomless dragon ponds. 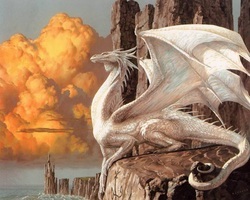 Dragons can be found in many habitats, and most can fly, but some - like the Amphiptere - spend much of their lives in the air, landing on high remote places to bear and tend their young. Some of these air- bourne creatures will have heavy beards and ruffs, which help with camouflage against the clouds.